Sourcing the right B2B list can seem complex and leave you feeling like you are in the 'hot seat'. Wouldn’t it be great if every business decision you had to make felt like a question on your specialist subject? 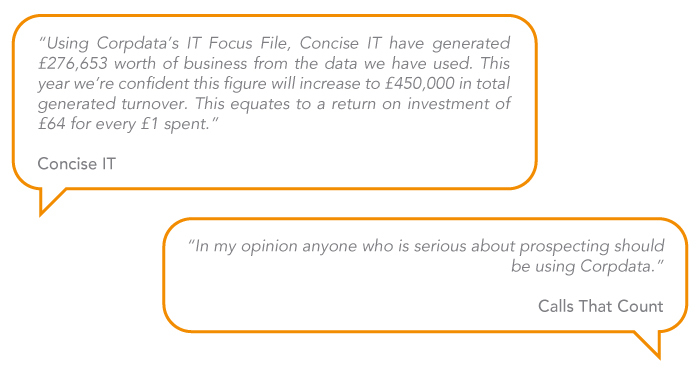 For Corpdata, UK B2B data is our specialist subject. We've been helping our customers deliver outstanding results for well over 20 years. We can help you target suitable companies, then choose the right contact for you to approach. You can be certain that the data is accurate and up to date. So the only question you need to answer is 'Who is your ideal prospect?' We’ll help you target the right contact, in the correct organisations. If needed, we will even consider the infrastructure of their organisation, be it online activity, IT, telecoms, call centres, or vehicles. Whether or not you have a current project, why not call our experienced Data Consultants. They will enjoy working with you and applying their specialist knowledge to your marketing goals. Above all, choosing Corpdata business contacts means you can sit back, confident that you are dealing with the UK's most respected B2B data provider. Call us now on 01626 777400, we are waiting for your questions. · Over 20% of UK business decision maker details change every year. · Corpdata offers a 2 for 1 data quality guarantee. · Over 2.7 million registered companies in the UK have only one director. · Corpdata research their data by telephone only from their UK call centre. · Understanding where your data came from is becoming more important. · Corpdata have testimonials from all types of companies, from the largest to the smallest.